"based on our investigation, we learned that there was an issue with the battery cell. An overheating of the battery cell occurred when the anode-to-cathode came into contact which is a very rare manufacturing process error"
Lithium itself is a reactive chemical and the truth is that any smartphone powered by a Li-ion battery does have the potential to explode or catch fire, if there's a short circuit. 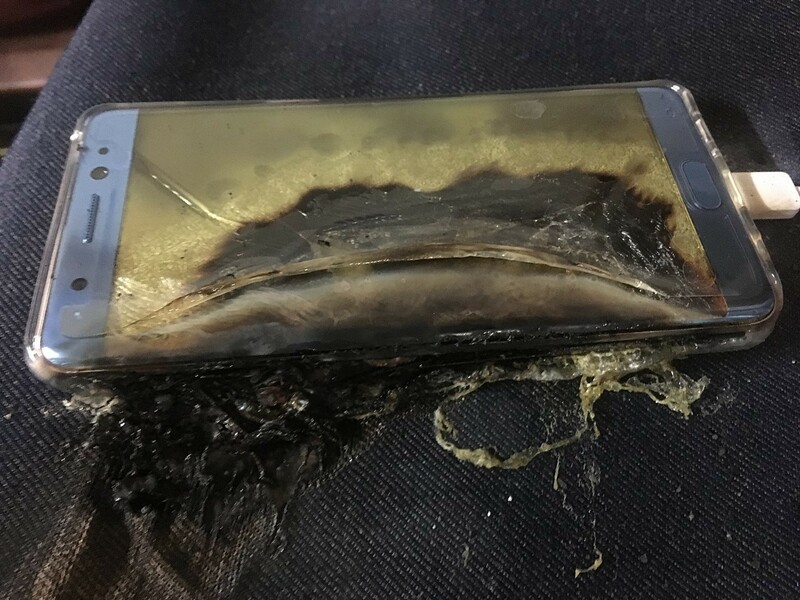 In case of the Note 7's battery however, some of the batteries provided by Samsung SDI had an inherent manufacturing flaw which resulted in overheating. The overheating led to multiple Li-ion cells cracking open, causing a thermal runaway. So if you have already bought a Note 7, it's time to take it back to the South Korean OEM! Feuds on Twitter are definitely not a new thing and according to Motorola, neither is Samsung's Always On Display or AOD. 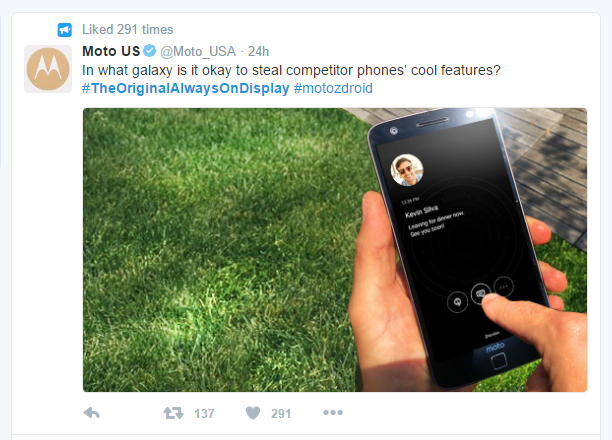 In fact, Motorola went as far as calling it stolen technology on twitter in light of the brand new Samsung Galaxy Note 7 which has the AOD feature. In their exact words, "In what galaxy is it okay to steal competitor phone's cool features?" Apparently, they are of the opinion that Samsung stole the idea of their Always On Display from the Moto X which Motorola had unveiled more than three years ago in 2013. The Moto X 2013 had a similar feature that had been termed as the Active Display. While it can be argued whether or not Samsung had copied the idea behind its own AOD from the Active Display, Motorola was probably not right in asserting that they are the pioneers in the technology. Nokia had done it back in the year 2009 with the Nokia N86 and had again brought the technology to the fray in 2013 with the Glance Screen found on their Lumia series of Windows powered smartphones. To be frank, it is difficult to claim a particular piece of tech as your own "property" if we are to ensure advancement of the tech world as a whole. 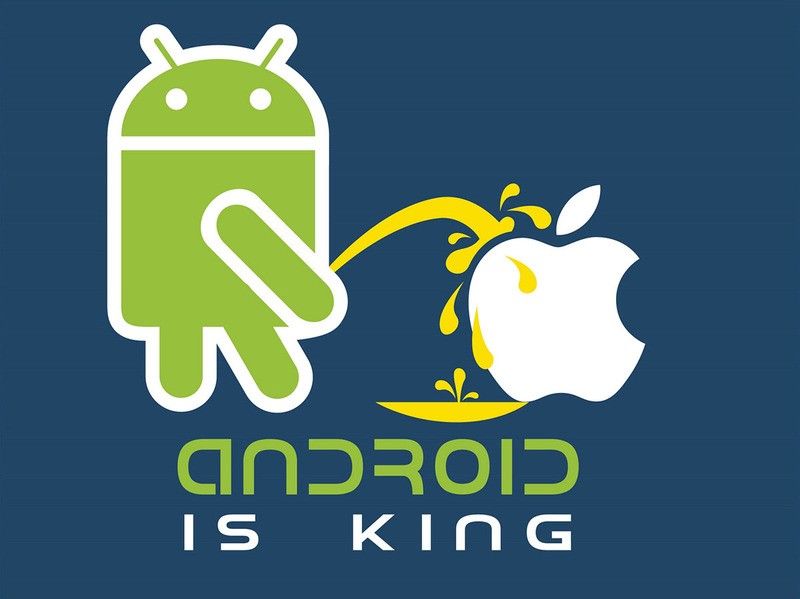 Gartner has unveiled its latest research about the state of the phone market in the second quarter of 2015, and there are two big conclusions: First, that Android is Dominating in the Top smartphones market worldwide. Secondly, that Google's Android and Apple's iOS together now control a whopping 96.8% of the smartphone market, and the other 3.2% is getting even smaller year-by-year. Apple's iOS is actually gaining new ground, growing to get a 14.4% of the market with 48.1 million devices sold in the quarter, up from a market share of 12.2% in the second quarter of 2014. Google's Android, on the other hand, remains the dominant leader, but while it has grown the absolute number in units shipped to 271 million (up from 243.48 million in Q2 2014), its share has actually dwindled to 82.2%, down from 83.8%. NVIDIA has kept its promise and the Wi-Fi-only version of the SHIELD Tablet has already been updated with Android 5.0 Lollipop. Fortunately, its LTE-enabled sibling won't stay far behind in terms of software, as it is also receiving the freshest variation of the confectionery mobile platform too. 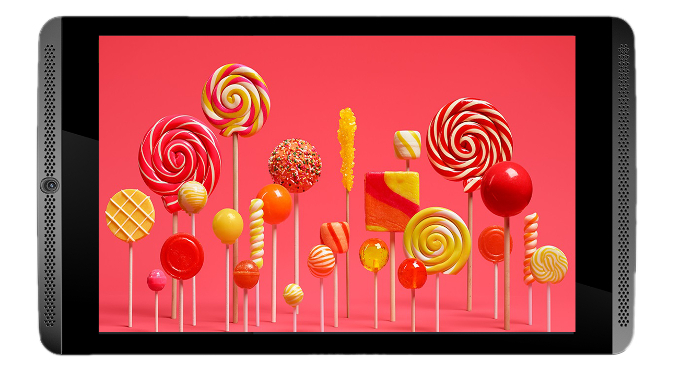 Apart from getting all the bells and whistles that Lollipop is known for, i.e. the ART runtime, Material Design, the battery-friendly Project Volta, etc. Apart from treating its LTE gaming slate to Android 5.0, NVIDIA has also added a little something something from itself the new NVIDIA Dabbler app, for example, is a powerful graphics-editing app, which comes with layer support, custom stensils, and various effects. The update is rolling out over-the-air just reach and grab it from your gaming tablet's Settings menu. If you don't own a SHIELD Tablet, on the other hand, you can get one as a part of NVIDIA's Black Friday bundle deal.